President Sonnenschein recently announced the appointment of Paula Barker Duffy as Director of the University Press, the nations largest university press. She will assume her post Aug. 1. Duffy will succeed Morris Philipson, who announced his retirement in July 1999 after 33 years of distinguished leadership at the Press. I am honored to have been invited to serve as Director of the University Press, said Duffy. Im excited at the prospect of moving back to a university environment where theres a commitment to the dissemination of knowledge in multiple forms and to a press where people take great pride in the quality of their achievement: the books they identify, edit and sell, and the journals they produce and distribute. Duffy comes to the University from a successful career in research organizations and publishing houses. For the last three years, she has served as publisher of the Free Press, best known for its books in the social sciences and public affairs and as vice president of its parent company, Simon and Schuster, New York. Carolyn Reidy, president of Simon and Schuster Trade Division, said Duffy has significantly helped to reposition the Free Press. Not only has Paula attracted and hired a strong team in every department of the imprint, but she also has been instrumental in redefining both the kinds of books it publishes and the ways in which it markets and sells them, she said. A native of Chicagos North Side, Duffy is a graduate of the Roycemore School in Evanston. She received a bachelors degree from Smith College and a masters degree in business administration from Harvard University. She began her publishing career at Brandeis University, serving as administrative director and publisher of the African Studies Association. 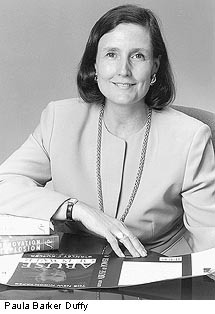 After holding editorial and marketing positions at the Harvard Business School Press, she became its director in 1989. Under her leadership, it became one of the most prominent publishers of business-oriented titles. From there, Duffy went on to be head of the publications bureau of the International Labour Office in Geneva, Switzerland. John Mark Hansen, Associate Provost and the William R. Kenan Jr. Professor in Political Science, is a member of the search committee that recommended Duffy. Hansen said Duffy will bring to the post a proven record in making research and scholarly publishing operations work more effectively. zation, she helped create a global publishing strategy for its program of research monographs and policy studies published in English, French and Spanish. At the Free Press, she skillfully guided a press with a distinguished history through a new and challenging time. In order to consolidate its operations, accommodate its growth and support its continuing worldwide success in scholarly publishing, the University began construction this summer of a new Press facility at 60th Street and Dorchester Avenue. Scheduled for completion in 2001, the four-story building will house book publishing and journal operations on three floors and have another floor available for a yet-to-be-named tenant. The University Press, which was founded in 1891 when the University was established, is one of the oldest university presses in the country. Sonnenschein praised Philipsons leadership, which firmly established the Press as one of the nations pre-eminent university publishing houses. Morris has devoted decades of creativity and innovation to his work. He has blended intellectual insightfulness and professional judgement in his work to raise the standards of the Press to new heights, Sonnenschein said. During Philipsons tenure, the University Press, which had fiscal revenues of $42 million in 1999, became firmly established as both the largest and one of the most intellectually serious American university presses. He has overseen vigorous and respected publications programs in both books and scholarly journals. The Books Division of the Press issued 172 new titles and 89 paperback reprints last year, and the Journals Division currently publishes 48 scholarly journals.